I'm the previous owner of an Australian Kelpie. We loved her to pieces, and she loved us to pieces, too. Sadly, we lost her to lymphoma over four years ago, and the heartbreak was immense. So, we're experienced owners of a working dog that are only now thinking about getting back into the game. I'm just wondering what experienced Australian Shepherd owners might have to share about their experiences. Keep in mind I'm not trying to replace our last dog, it's just where my experience lies. I'm wanting a smart, trainable and loyal dog. I really don't like dogs that don't really interact with their people. I want another member of the family. I'm looking for a dog that will be a watch dog, but trainable to stand-down when we say it's ok. I want to be able to still have company without having to stay on-top of a dog. Our last dog made it hard to do this. Being high-energy, she just would not leave people alone without constant nagging and reminding. I'm ok with some shedding, but not into floating fur becoming a standard in my house. How are they with shedding? I haven't had to deal with shedding much, ever, and while I'm ok with a little, I don't want to be wearing it. Are they prone to wandering if they get outside of a fenced yard? We could leave our Kelpie on the front porch and she would dutifully wait for us, no fence needed. Are they mouthy? Are they good with children they don't know well? I don't want to wind up in the situation where we can't have friends over with young children. Our last dog would flip out whenever we got a blender out (but strangely was ok with vacuums). It wasn't a deal breaker, but got tiresome. Are Aussies prone to this sort of behavior too, the flipping out over stressful things? While we have a large yard, and our dog had the run of our house and yard, we do still have work and school and are gone 7am-5pm 4 days per week. Our Kelpie did fine with this and did fine mentally during the boring hours. How is an Aussie going to adapt to this schedule with his/her people gone that much? How much of a watch-dog will an Aussie be? Overly so, or just enough. Do they shed a ton? Do they like to escape and run? Do they bite or otherwise not get along with kids? How much do household appliances stress them out? Will they do ok being alone during the day? Thanks so much for taking the time to read this, and responding if you can! Aussies are great protectors of house and their humans. They shed a TON and then some. They require training from an early age especially attention training as when their noses engage their ears disengage. Aussies are sensitive to noise. My Ellie goes in another room when I tendering meat, use the blender or vacuum. They are extreme sensitive to thunder and lightening strikes, Ellie tries to squeeze between the tub and toilet. As for biting, Ellie is 5 years old and has never bitten anyone, she's snapped at another dog who got in her face, but no people. Side note, socialize them early and continually with other dogs and people. As Aussies are a herding breed, they will try to herd anyone or thing that is moving quickly or running. Herding can mean nipping at legs, so be aware. I hope this has helped. All in all I adore my Ellie, quirks and all. And talk about trainable, Ellie puts away her own toys on command :) She is the love of my life. Good luck! We have two and the effort and experience has been rewarding. Given the breed's general traits, all your requirements and concerns will be met except the shedding. They shed twice a year - every day for 6 months and then every day for the next six months. This can be managed with brushing. They are super smart and need a clear leader - you. They also need their mind stimulated (training, puzzles) and body exercised - physical training/exercise/herding. They are more watch dog than guard dog and I haven't known any to attack, but some can get nippy as it is in their breeding as part of their herding traits. HI! We currently have our second Australian Shepherd. Unfortunately what you want is a generalization of Aussies across the board and it just can't be done. Our first Aussie like our second was extremely smart. Our first Aussie never barked or growled at another human OR another dog. She was high energy but very laid back in that respect. Aussies, like other dogs, are influenced by their environment. Our second Aussie barks when people come over (great watchdog) and was trained to settle very quickly. She learned what we considered some bad habits from our smaller Yorkie Poo but I'm told by some it's normal Aussie behavior. 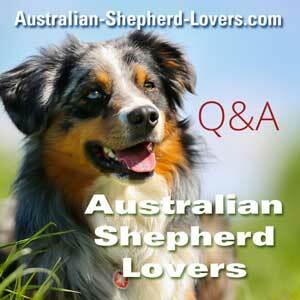 Our vets have adored both of our Aussies and have commented how nice they are. One time I asked "are there not so nice Aussies out there?" and he replied with yes and strongly believes they are greatly influenced by their owners and surroundings. We got a second Aussie because they ARE very family oriented and literally follow you everywhere. Even though our second one is different from our first, we love and enjoy her just as much. They DO shed! I take mine to the groomer once a month to help keep that undercoat from shedding so much and I keep the back end, tummy and legs trimmed down to make care easier. She LOVES to swim! Some Aussies don't. The most important thing to have success with your Aussies is training. Like I said, she had a bad habit and we had to bring in a trainer to help us deal with it which we did! I think that's all you asked for. Can't see your questions while I'm typing. Good luck! !